The $1 million UC Cooperative Extension Presidential Chair for California Grown Rice has been awarded to Whitney Brim-DeForest, UCCE rice advisor for Sutter, Yuba, Placer, Sacramento and Butte counties. Brim-DeForest said she will use the funds generated from the endowed chair to hire a full-time technician to monitor a research study at UC Davis on weedy rice. Weedy rice is the same species as cultivated rice and it produces rice, however the grain falls off the plant before harvest. She is part of a team of UC scientists that includes UCCE advisors Luis Espino and Michelle Lindfelder-Miles, and UCCE specialists Bruce Linquist and Kassim Al-Khatib who are conducting the five-year demonstration project to help farmers manage the problem. UCCE advisor Whitney Brim-DeForest in a rice field. In the UC Davis experiment, the scientists plan to demonstrate two potential weedy rice management strategies: rotate the rice crop with sorghum and create a “stale seed bed,” in which the field is irrigated and plants allowed to germinate, and then killed with an herbicide before the desired rice is planted. Half the funds for the endowed chair was provided by UC President Janet Napolitano; the other half was donated by the California Rice Research Board. The chair appointment will be for a five-year term, and then reviewed and renewed or offered to another specialist or advisor working on California rice. Brim-DeForest joined UCCE in 2016 after serving as a graduate student researcher in the Department of Plant Sciences at UC Davis, working at the California Rice Experiment Station in Biggs. 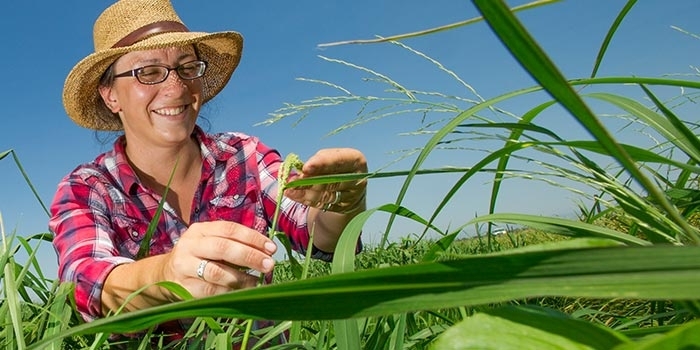 She managed the UC Davis Weed Science field and greenhouse trials, and worked with industry and academic scientists to design field and greenhouse trials for weed management in rice.